» Where Will Robert Griffin III Land? Where Will Robert Griffin III Land? Thank you, thank you, thank you, Kevin Demoff. I was worried I was going to have to take an online course in elbow nerve endings or spinal fusion surgery if I wanted to keep up with the NFL offseason. And frankly, with my double major in air conditioning repair and criminal justice, I just don’t have the bandwidth. The COO of the St. Louis Rams shook up the NFL landscape Tuesday by declaring, if I may put this hyperbolically, open season on the Rams’ no. 2 overall pick in the draft. We now have a Robert Griffin III bidding war going on. Let’s take a look at the RG3 Power Rankings, shall we? The Redskins are reportedly considering a package that would include two first-round picks for the Baylor product. We also hear that Mike Shanahan is offering the house-hunting services of John Beck, who will be starting a career in real estate upon Griffin III’s arrival. Mike Holmgren is also apparently interested in securing the Heisman-winning services of Griffin III. This will come as a great shock to Colt McCoy when he finally regains consciousness. The other major competitor. Rumor has it Miami’s first choice to take to quarterback prom is Peyton Manning. This makes sense. There is no finer neck specialist in the nation than Rick Ross. But Griffin is definitely a quarterback you could build a franchise around. Still, there are additional reports that suggest that while the Dolphins may indeed make a run at the no. 2 pick, they’d do so to acquire Oklahoma State wide receiver Justin Blackmon. The author of that report? Matt Moore. The dark horse. And when I say “dark horse” I mean the crazy horse that Nick Nolte mumbles to and eventually has to be taken out behind the barn and put down. 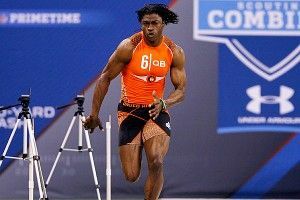 Yes, there was a report that the Eagles met with RG3 at the Combine. And, yes, it looks like the Eagles will be without the services of Vince Young. And, finally, yes, the Eagles did make their offensive line coach their defensive coordinator. But this one seems too far-fetched, even for Philly.